Followers of the Swindon WiFi’asco will already be aware that the Public/Private partnership scheme ran into serious difficulty in 2010 after one of its three partners, (Digital City (UK) Ltd), spent the £400,000 of public money lent to it by Swindon Borough Council but failed to provide the town with the promised Borough-Wide WiFi network. To all intents and purposes the project appeared to be completely stalled and public attention turned to the subject of the ‘lost’ £400,000 and who, if anyone, the Council would pursue as it tried to get our money back. Significant heat and light was produced by the spectacle of Garry Perkins, the deputy leader of Swindon Borough Council, (also a Director of Digital City), unsuccessfully trying to lay the blame for the financial collapse of Digital City on members of the public. North Swindon MP Justin Tomlinson recently described Councillor Perkin’s claims as ‘nonsense’. Never afraid of making bold, (and all too often inaccurate), claims, Cllr Perkins then promised that a ‘new investor’ investor had been found and that the £400,000 would be repaid in a matter of weeks. At 02.00hrs this morning Companies House records showed that Swindon Borough Council were still a minority shareholder of Digital City (UK) Ltd, but it appears to be behaving as if it it owns or controls the company. To be clear, Swindon Borough Council is a separate legal entity from Digital City UK Ltd and, as I understand it, the Council should be seeking to recover 6 months worth of unpaid loan installments and the outstanding loan capital of £400,000 from the Directors of the company. Had the council ‘secured’ the loan by registering a charge against the assets of Digital City in 2009, (something it had stated it would do – and then didn’t), at least some of the defaulted loan would be recoverable by seizing assets. The council forgot or, to be far more specific, Hitesh Patel, the Accidental Director of Digital City and also Swindon Borough Councils Director of Business Transformation, simply failed to register the legal charge within the time limit set out in law. SBC’s legal eagle, Stephen Taylor, recently tried to pass this failure off as a ‘typographical error’ instead of simply admitting that the Corporate Director level of the council is riddled with incompetents. I think the Council should be pursuing Garry Perkins & Rikki Hunt for the £400,000 (plus missed interest payments), but instead seems intent on spending yet more public money to keep this scheme alive, and Garry Perkins out of court. Perhaps this is why, for several months, Perkins has been hysterically babbling that a ‘new investor’ for Digital definitely exists. Yesterdays publication of council documents make his claim seem slightly more credible today than they seemd last week. The investor is demanding a ‘confidentiality and non-disclosure’ agreement before it will enter discussions with the council. For me, this is where the charade falls apart. I don’t believe any sensible investor would look twice at Digital City. It owns almost nothing of commercial value, has not completed a fraction of the promised wifi network, has only 20 customers paying a maximum of £9.99 each month and has been defaulting on its £400,000 to Swindon Borough Council for the last 5 months. The company is obviously fucked – so why the confidentiality agreement? 12. What steps is Swindon Borough Council taking to establish why Mr Hunt resigned as Director of Avidity Consulting Ltd and who is now in legal control of the 30% share of Digital City (UK) Ltd held by Avidity Consulting Ltd after Mr John Richard Hunt resigned and was replaced by his wife, Mrs Laura Hunt? Secondly, this confidentiality agreement will effectively neuter all aspects of Council Scrutiny of every aspects of the WiFiasco while it is in force. This will be especially useful for an administration that has already declared it wishes to prevent public scrutiny of ‘deals’ it wishes to make in the future. But, I hear you ask: “This is a lot of trouble to go to if the intention is to save political blushes, avoid the embarrassing spectacle of Swindon Council taking its Deputy leader to court to recover £400,000 of public money and last, but not least, give Cllr Perkins an unfair advantage over his political rivals in the May local elections?” and normally I would agree with you, but I’d ask you to consider the following bit of semi-recent history and then reflect on current wifi’asco related events. In 2007 the last Labour government funded an electronic voting pilot/trial in Swindon and on polling day voters were able to vote electronically from 64 locations in Swindon. Each of the 64 polling stations in Swindon was equipped with between 2 and 10 laptop computers and connectivity at each polling stations was provided by either wireless technology, (WiMax), or BT broadband. I understand that 8 polling stations had to use a BT Broadband connection because their locations were unsuitable for Wimax connectivity but the remaining 56 polling stations were equipped with Wimax connectivity. At the time, there was quite a bit of news coverage of the e-voting trials but that gradually subsided and interest in Swindon Councils Wimax network waned until it had faded almost completely into the background to the point when nobody seemed to remember our Wimax system even existed when Digital City’s ‘new’ scheme was being hailed by the council as the best, most ‘innovative’ and ‘unique’ thing to arrive in Swindon since Mr Hovis started slicing his bread. At some point though, someone at Swindon Borough Council apparently remembered it already owned a Wimax system – possibly when they realised the Digital City Scheme bore the flightworthiness characteristics of the Hindenburg – pulled the dust covers off and started pumping serious amounts of taxpayers cash into it. About £98,000 to be reasonably precise, plus the annual licence fees the Council is now paying to Ofcom – all for a system it doesn’t seem to want to talk about. If I’m right about this, Swindon Borough Council already owns a Borough-Wide Wimax Hi Speed wireless internet system which comprises up to 64 fully functioning Wimax transmitter/receivers mounted on 64 separate buildings. Make no mistake, this is a large industrial grade high-speed wireless internet system which is well-suited to being expanded upon and used as the ‘spine’ of a fully functioning Borough-wide wifi mesh. 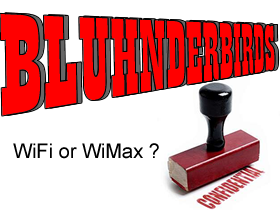 At present, members of the public cannot access this Wimax systeme because it is a high-speed ‘point to point’ system, (this type of system is often used where cables or fibre optics can’t easily be put), which delivers internet access to singular points, (imagine shining a laser at a particular point and you’ll get the principle), but it is from each of these individual points that a properly open and publicly accessible conventional wifi system can branch out, (using the same lamp post mounted transmitters used by Digital City in Highworth), along the streets of Swindon. I also suspect it is no coincidence that the Council intends to spend £1,200,000 (yep, £1.2 million), ‘upgrading’ lamp post in the Borough. An odd thing to do when it is cutting jobs, services and everything else it can to the bone. In conclusion then, when the Council says it it looking for investors in the Wifi scheme, I humbly ask that readers consider the above and reflect on whether the council is seeking investors solely for the failed Digital City Wifi’asco, or is actually using the heat, light and smoke generated by the WiFi’asco to disguise a much bigger purpose than any of us had previously supposed: That the next ‘deal’ will probably include the much larger but-not-much-discussed Wimax scheme, £1.2 million worth of new infrastructure and last, and most definitely least, the remnants of the failed Digital City scheme in Highworth. For what it’s worth, I think the confidentiality agreement is intended to achieve so many objectives, (mostly political), that it will almost certainly fail to achieve most if not all of them.